Patrick Ingram grew up in both New York and Virginia. As a boy, he identified as being gay as early as he could remember and came out to his parents during his junior year of high school. He said, "On December 1, 2011 I was sick. I had lost weight, had thrush along with respiratory issues. I just didn't feel like myself. I decided to get tested and find out my status. It was the most adult decision I had ever made." He went to the local health department for his test and said, "The health department nurse was asking all kinds of personal questions and being generally condescending. It was just a horrible experience. I took the 15-minute rapid test and it was the longest 15-minutes of my life. "When the results were positive, all I got was a list of numbers to call. After running in circles for awhile, I almost gave up. I'd look online for young black men similar to myself for guidance and I couldn't find anything." Patrick was shocked by the lack of representation on social media and other media outlets and platforms so he decided to do something about it himself. He says, "I started making videos because nobody was doing that. I became an advocate for myself and became educated at the same time." He was working on his Bachelor's Degree in Public Health and at the same time working for the health department as a counselor. He said, "I was living, eating and breathing HIV. I'd put in 12-hours at the health department and at the end of my shift, I'd be making videos, public speaking. HIV became my identity and I was quickly becoming burned out." 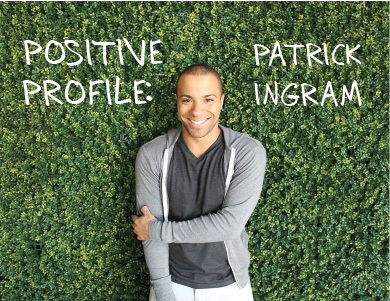 Patrick decided that he needed to establish his own identity and not let HIV define him. "I was a flight attendant and I recently went back to doing that. I still blog and am involved with thepozlife.com but a lot of us don't address our own mental health issues. When you're totally involved in and with HIV, it can become a comfort zone because it's what you know. Sometimes you need to leave that." Now at 26, Patrick is in his senior year of his Bachelor's Degree in Public Health and is looking forward to accomplishing that goal. He says, "Some days are bad days, but I have what I call "My Roots" which are my family and my best friend who listen and keep me going. I have a dog that gets me up and outside for a walk on those bad days. It's also nice to have something that's super excited to see you when you get home." He offers a lot of advice to someone who is newly diagnosed. Patrick says, "Take it day-by-day. At first, you'll feel afraid and overwhelmed. My medical team told me that I needed to become educated. You need to know and understand the meds you're taking and people with HIV have an obligation to know about PrEP. "Be cautious of who you tell but it isn't healthy to hold it in either. Use a peer support group to open up to. It might sound weird but be proud of your status, be confident and comfortable and advocate for yourself." For more information about Patrick and to see his blogs, videos and other helpful information, go to www.thepozlife.com. You'll also find links and access to information on Twitter, Facebook and YouTube.